The following information is provided for your consideration in regard to a topic that has been questioned by some of the best minds in the hobby. The goal of this column is to compact many threads interested in a particular discussion to a user friendly layout. The information contained in these articles is here to help educate and hopefully enhance the hobby, while helping you to make informed decisions on aquaria upkeep. The author(s) assumes no responsibility for any consequences that may arise from the use of this information. While the concept of using an organic carbon source to reduce nutrients is not new to the hobby, it has recently gained considerable popularity. The number of carbon-source dosing threads on Reef Central (RC) currently reinforces this statement. These threads range in dosing of a single carbon source: vodka, sugar, or vinegar, to the combination of these three. Notably, the first major thread on RC for this subject was quite lengthy starting a couple of years ago ("Dosing vodka to bring down N and P"). This thread highlights the results of many aquarists that were achieved through careful vodka additions to their aquariums. 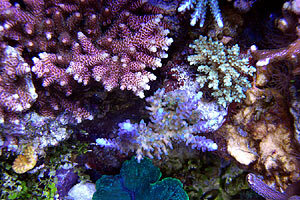 Users note a dramatic decrease in nitrate and phosphate molecules, while others note increased coral coloration and clearer water. In this article we will discuss these potential benefits and give instruction on vodka additions while condensing the many threads on this subject into a more easily readable format. Before starting, as with any project, there is a great deal of information that needs to be taken in and understood. While reading this if there is any question that is left unanswered please ask either someone on RC or in your local reef club. We ask that you read and ask questions until you have a firm understanding of the concepts behind vodka dosing. There are no dumb questions! And remember as with all good things it takes time, effort, and understanding to do a task properly. What is an Organic Carbon-Source? Carbon is the fourth most common element in the universe. It is unusual in nature as it has the ability to self-polymerize forming long chains. Carbon’s abundance combined with its ability to form a wide range of polymeric structures allows this molecule to form essential molecules found within all organisms. 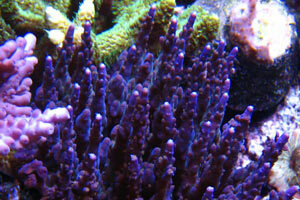 Carbon is found within your reef aquarium in abundance as inorganic bicarbonate. When these carbon molecules are incorporated into more complex forms within cells they are termed organic. It has been reported that addition of certain organics can help enhance the appearance of the reef aquarium by reducing nitrates and phosphates. To do this, people have experimented with sugar, vinegar, and vodka. All of which are organic. Our discussion is focused on vodka addition. The reason vodka is used in comparison to other spirits such as whiskey, gin, or brandy is that vodka is more pure in composition than most other spirits because of its process of distillation. Other spirits are brewed with additives that enhance flavor. Vodka is not. Because it lacks additives it consists of mostly water and the organic compound ethanol. For this reason many feel vodka is a safer addition than other spirits by eliminating the possibility of adding other organic molecules that may act negatively within the reef environment. 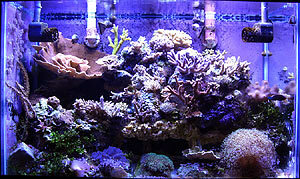 The main purpose to dose organic carbon is the reduction of excess nutrients in the reef aquaria. The two main nutrients reduced from organic carbon addition are nitrate and phosphate molecules (NO3 and PO4 respectfully). 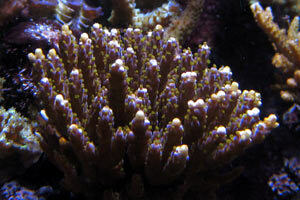 The reduction of phosphates, in turn, allows for enhanced calcification and growth of corals. 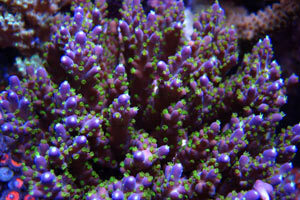 Additionally, lower NO3 and PO4 have the added benefit of reduced nuisance algae, both bubble and hair. This observation has been reported numerous times by vodka users. The reduction in algae is the result of lower NO3 and PO4 within the water column and not a direct effect of ethanol addition. These potential benefits have lead some to add foreign organic carbon sources not usually found in the reef ecosystem to their tank. The organic compound most frequently used is ethanol (sold in stores as vodka). The addition of vodka/ethanol is thought to increase bacterial biomass. For this, vodka addition would result in bacterial growth and reproduction. During this process nutrients in the water (including NO3 and PO4) are taken up for the formation of new macromolecules that are needed in cell synthesis and viability. Due to this rapid growth and reproduction, NO3 and PO4 can drop quickly from detectable levels by most test kits on the market. The increased biomass of the bacteria leads to a notable increase in skimmate production, removing more waste than without vodka addition. The increased skimmate is thought to remove the bacteria or bacterial biproducts that have assimilated the NO3 and PO4 within the water column leading to NO3 and PO4 depletion. Many view organic carbon dosing as unnecessary as organic carbon isn’t thought to be limited in the reef aquarium environment since larger organic molecules are found within the water column at any given time. However, the amount of organic carbon that heterotrophic bacteria can utilize must be limited due to the reported benefits and observations on Reef Central from organic carbon dosing. This method is applicable for systems that have had the inability to effectively remove both NO3 and PO4 from their system. Stable systems that do not contain high levels of NO3 and PO4 may not benefit to any great extent by employing carbon source dosing. Equipment - Skimmer, An Absolute Must! Gas exchange. The increased bacterial biomass and growth will decrease your dissolved O2 levels in the water column. Too much vodka can result in a drastic decrease of O2 and can cause stress to your reef inhabitants, if not death. Exporting bacteria/macromolecule mass. Vodka addition results in lower NO3 and PO4 levels. You will want to export the incorporated nitrogen and phosphates that you are cultivating by organic carbon dosing. Efficient skimming allows such removal. Jörg Kokott, a key contributor to the original thread, recommended the use of ozone during the duration of vodka dosing to maintain high levels of dissolved O2 in the system. This decrease in dissolved O2 is indirectly observed in ORP meter readings after vodka addition. Though not an absolute requirement, as told from many RC participants, ozone may add an extra level of protection by increasing O2 levels during an overdose. Gelbstoff, German for yellow matter, is reported to buildup in aquariums over time. Additions of vodka or other carbon sources have the potential to accelerate the yellowish water buildup from organics. To solve this problem, people have utilized ozonators to breakdown of the organic molecules responsible for resulting in yellowish water. Ozone is an attractive choice as it would not only breakdown the gelbstoff but will also add O2 to the water in case of an overdose. For people not interested in running ozone other solutions for this problem are the addition of granulated activated carbon or through regular water changes. Left photos are pre-dosing of vodka. Photos courtesy of Mike Woodard (miwoodar). Pictured above is miwoodar's tank. This aquarium successfully used vodka to lower nitrates and phosphates. His setup utilizes a skimmer but does not utilize ozone. 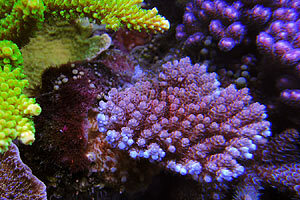 After reduction, continued growth and coloration was observed amongst SPS and LPS corals. These instructions will focus solely on using 80 proof vodka (40% ethanol by volume). They do not pertain to other organic carbon sources that are also currently used, including common table sugar (sucrose) and vinegar (sodium acetate). The dosing instructions below were as dictated by Jörg Kokott and have been used successfully by us. Test your system’s NO3 and PO4 levels. Do not dose if you do not know this! We recommend good test kits that have some low level of sensitivity. This will be important later on to determining a maintenance dose regimen. During the initial dosing test often and adjust dosing parameters as needed as each tank’s requirement will be different. Dosing accuracy is of the utmost importance. A graduated measurement tool such as a syringe will come in handy. A journal of additions and test kit measurements is recommended. Estimate your Net Water Volume (NWV) of your system. (Aquarium volume + sump + refugium + reactor volumes) – (live rock displacement). It can be difficult to accurately measure the amount of water being displaced by the live rock. If unsure of the volume of live rock we suggest taking 30% off your display tank’s Gross Water Volume. For vodka dosing there is absolutely no harm in underestimating the Net Water Volume and is recommended. As an example, let us assume that your setup contains 100 Net Gallons. The starting dosage is 0.1ml of vodka per 25 gallons (~100 liters) NWV daily continued for three days. For 100 Net Gallons, your dosage would be 0.4ml daily during this period. It has been suggested to cut the daily dosage in half and dose twice daily for more consistency. Days 4-7, double the daily dosage to 0.2ml of vodka per 25 gallons NWV. Your example dosage would be 0.8ml daily during this period. Each subsequent week add an additional 0.5ml of vodka regardless of aquaria volume. At this point your example dosage during week two would be 1.3ml daily. If you do not see nutrient levels decrease during this week, the following week add an additional 0.5ml for a daily dosage of 1.8ml daily. When your NO3 and PO4 levels start to drop maintain the current dose. For example, if you were on week two when NO3 start to fall on 100 Net Water Volume you would add 1.3mL daily at this time for the continuing weeks until the NO3 becomes undetectable. When your NO3 and PO4 levels drop near undetectable with your test kits cut your current dose in half. This will be your starting maintenance dose (if the levels drop during week 2 then the dose after reaching undetectable levels would be 0.65ml daily [1.3ml divide by 2]). Continue to test for NO3 and PO4. If levels become detectable in the future increase your daily dose by 0.1ml increments per week until the levels start to decrease. If you maintain that dose the levels will eventually drop back to undetectable. This would become your new maintenance dose. Throughout your dosing, observe your livestock daily to look for any signs of stress. If stress of any sort is noticed stop dosing, or at a minimum cut back by reducing your dose in half. If for some reason you cannot remember if you’ve added for that day skip it. It is better to accidentally miss a dose than add twice as much (a journal will keep this from occurring). Never double the dose for missing a prior day! For ease of use these tables have been generated to reflect a dosing schedule regimen for different common proofs of vodka. They follow the directions stated above and are rounded off to the nearest tenth decimal for simplicity. With use of these tables if you notice NO3 / PO4 dropping do not increase as stated within the table for the following weeks but follow the directions above starting at #6. Bacterial Blooms - High additions of carbon sources at once are noted as production of slimy white strings upon rocks or in sumps that become noticeable a few hours to a day after addition. There is no clear evidence that this is detrimental to your tank. If this is observed dropping your dose by 50% will result in the disappearance of these strands. Additionally, these strands may have given rise to the notion of "bad bacteria". By this forum users mean pathogenic bacteria. But there has not been any documented evidence of such yet. If you happen to overdose your tank with an organic carbon dose, you will stimulate a bacteria bloom, this appears like a snowstorm in your tank. After a day, the tank will clear up. During this time people have reported mixed results on survival from this snowstorm. 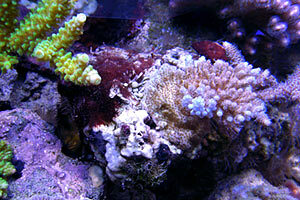 Stony_Coral has purposefully caused this on one tank and while ORP readings dropped, no loss of livestock was observed. However, people have mentioned loss of more delicate fish such as anthias during the visualized bloom. In general, a visible bloom will not occur if vodka is dosed as per the instructions above. Bacterial Populations - Currently, it is unknown which bacterial populations grow with the addition of organic carbon. Some have suggested a single organic carbon source, such as vodka, results in monoculture or single specie growth. Due to this ideology, it has been increasingly common to dose multiple carbon sources as this may create additional bacterial diversity. Most likely, in any one organic carbon source addition there are several species that become dominant. However, it has not been decided whether diversifying impacts corals either beneficially or negatively. Burnt tips - Some users of organic carbon dosing have reported the tissue loss at the ends of their SPS. 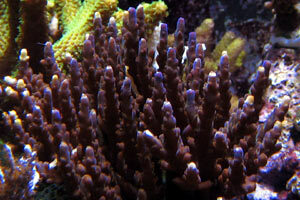 These "burnt tips" have recovered once the user reduced the alkalinity levels within their tank to alkalinity levels closer to natural seawater (7-8 dKH), pictured below. Unfortunately, the root cause for this is not known. Loss of tissue at tip ends with high Alkalinity. Restoration of SPS tissue color and growth. Photos provided by Peter Martis (SDguy). Carbon Sources - Reduction in nitrates and phosphates can be accomplished with ethanol and vinegar with great efficiency. Other molecules that may aid in nutrient reduction are sugar, acetone, methanol, and isopropanol. We have not experimented with sugar though there are many threads on RC about this topic. The latter three have been called into question about the possible effects on health of the owner as well as the wellbeing of the aquarium inhabitants. For these reasons, we chose to describe ethanol addition as a means to decrease both nitrates and phosphate levels. 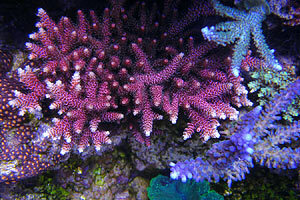 Coral Coloration / Paleness - With reduction of nitrates/phosphates SPS corals have been reported to increase in color pigmentation and have even been reported to pale over time. This is outside the scope of the article presented here. However, if looking for recommendations for additives that will reduce paleness and enhance SPS health check out amino acid addition as this has been reported to enhance coloration in a ULN (ultra-low nutrient) environment. If for any reason you experience coral bleaching, please stop vodka dosing! Deep Sand Beds - People with Deep Sand Beds (DSBs) have reported issues with vodka dosing. These issues seem to be from increasing vodka additions over time without seeing a decrease in nitrate/phosphate levels. Users with DSBs that are failing to reduce nutrients efficiently may be experiencing a lack of nutrient decrease from the build up of organics within the DSB. If this were the case it would take more time to cycle out the nitrates within the system as there is now a hidden bed of organic waste that needs to be removed. Do not get discouraged or increase your dose irrationally as the vodka addition is working but not detectable as the DSB needs to cycle through completely before a reduction is observed. Keep adding vodka slowly until decreasing levels are detected. This may take months to achieve. Once there maintain that dose until nitrates start to decrease. At this point, it may be best to cut the dose in half and cut it in half again once undetectable is reached. Many people with DSBs who have reported issues increase vodka additions quickly and irrationally, leading to a detrimental overdose. Feeding - A derivative of vodka dosing is the ability to increase feeding for fish or invertebrates without reducing water quality. Since the vodka is essentially removing the waste products (nitrates/phosphates) from the reef aquarium, addition of extra food is welcomed if not encouraged. Old Tank Syndrome - Reef systems that have been running for longer than a year have reported vodka-dosing building up a thick sludge within some area of their reef. The thought is the buildup of organics and NO3/PO4 over time results in a high growth of bacteria from the addition of vodka. In tanks that are older, where detritus has built up, careful observation of the tanks state is needed. If thick sludge develops within the tank immediately reduce the dose by 50% and continue at that point until the sludge has disappeared and then slowly increase as per instructions laid out above. Phosphate Removal / Granulated Ferric Oxide (GFO) - One of the most common questions is whether to use a phosphate removal material, such as GFO, with carbon dosing. GFO is useful in removal of phosphates from the water column. Essentially, by carbon source additions, the same net result is being achieved. It may even be counterproductive to run GFO while dosing an organic carbon source as both nitrate and phosphates need to be present for this to work properly. Therefore, it is not needed and not commonly recommended but some people continue to run phosphate reactors concurrently. Water Clarity - Even without the use of either ozone or activated carbon, water clarity is said to improve dramatically with the vodka method. This has been stated by nearly everyone using this method and may be an indirect result of nitrate/phosphate removal from the water column. Dr. Jean Jaubert made similar claims of his plenum system, where nitrates and phosphates are also depleted and water clarity may be a result of this depletion. Vodka Brand - One of the most common questions is which brand is the best. Honestly, it will make little difference on which brand is used. The most common response is to find the cheapest vodka brand and go with that. Do not use vodka that contains flavor additives such as raspberry or mango vodka. Additionally, industrial ethanol should not be used as a substitute as it contains denaturing agents that are toxic. 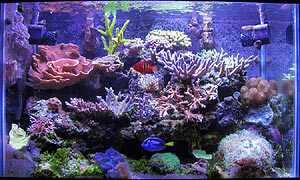 Vodka dosing has become a simple method for reduction of nitrates and phosphates that have plagued many reef aquarists. Here we have described a method for reduction of these nutrients by stimulation and promotion of bacterial growth through the addition of vodka. Though the underlying mechanism and actual bacteria populations are unknown the results are impressive for their ability to both rid the system of excess nitrates and phosphates. Thanks go out to the many who have contributed to advancing this hobby. The detailed descriptions and results from fellow RC members is the reason behind writing this article. Without participation from the cohort of people on RC that bring their own talents to the hobby this article would not have been written. We want to recognize Peter Martis (SDguy) and Mike Woodard (miwoodar) for providing the photos within this article. "Dosing vodka to bring down N and P."
"Let’s talk about Vodka/sugar dosing"
"Let's see 'em - Before and After pics of Vodka Dosing!" 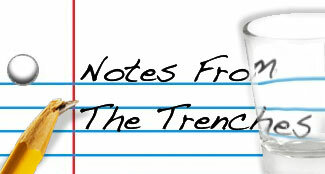 If you have any questions about this article, please visit the Notes from the Trenches forum on Reef Central.